Deacon Greg Kandra is ordained and ministers in the Diocese of Brooklyn. 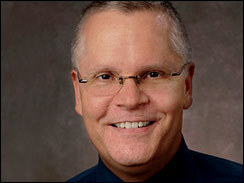 He writes a fantastic blog, The Deacon’s Bench, at Beliefnet. His Homily for today, the First Sunday of Advent, is a stunner. It is reprinted here with Deacon Kandra’s permission. Anyone looking for interesting holiday recipes may have stumbled on a new word that has entered the American lexicon: “Cherpumple.” It’s a desert, created last year by Los Angeles writer Charles Phoenix – a diet-destroying, gut-busting feat of cooking that seems guaranteed to induce sugar shock. 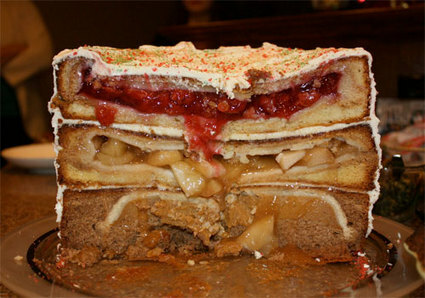 It’s three different pies, stacked one on top of the other, and baked into one gargantuan “monster pie” with three layers – cherry, pumpkin, and apple, hence the name “cherpumple.” The recipe has swept the internet and has become a sensation on YouTube. I showed a picture of a “cherpumple” to my wife and she agreed with me: it’s absolutely disgusting. Some things just aren’t meant to be mashed together like that. But I have to wonder if we haven’t done something similar with Advent and Christmas. For all intents and purposes, we have managed to create one massive season – “Chradvent” – that conflates two distinct seasons into one. And it’s starting earlier and earlier. The readings today alert us to something great about to begin. The language is emphatic. Night is ending. Dawn is at hand. “Stay awake.” Put on “the armor of light.” And “let us go rejoicing to the house of the Lord.” There is a sense of anticipation – the kind we celebrate at every Eucharist, when we pray that we “wait in joyful hope for the coming of our savior, Jesus Christ.” Advent is that waiting, that moment of joyful hope, lived out across four weeks. We symbolize that, and ritualize it, with the Advent wreath. But we don’t light all four candles at once. We go one at a time, so the light gathers and grows. If you have an Advent calendar, you don’t fold open every window at once, but you go one small window at a time. Later in the season, we will sing the haunting refrain, “O come, O come, Emanuel, and ransom captive Israel…” We are captives awaiting freedom, prisoners held in dungeons of despair. But light is coming. Freedom is coming. Are we looking to what will be – or are we already there? If we jump right into the holiday season, we forget to wait, and watch, and wonder, and pray. We neglect the “joyful hope” that is so much a part of this beautiful season. When Christmas arrives, it will seem almost anti-climactic: one more day in a long litany of jingling bells and canned carols. This year resist the urge. Wait a while to get the tree and hang the wreath. Turn down the Christmas music. It’s okay: it will be there in the middle of December, just as it was in the middle of November. Instead, use these weeks to pull back, to retreat from the ho-ho-ho and fa-la-la-la-la. Find time to look within — to pray more deeply, and converse more intimately with the One who is coming. Ask Him: How can I prepare for you? What can I do to welcome you into my life? If all of us do that, we may be surprised at the answer. And we’ll actually be able to HEAR the answer if we give ourselves over to the “garment of silence” that Dorothy Day wrote about. “Cherpumple” is over the top, and unhealthy. And so, I think, is “Chradvent.” So pull the two seasons apart, and live each of them as fully as possible. Let’s look forward to a merry Christmas. But let’s also use this opportunity, as well, to enjoy a blessed and holy Advent. I simply do not do anything until December 17, when the liturgical calendar turns from readings dealing with the second coming of Christ to the readings leading up to the Nativity. It’s healthier, I think. 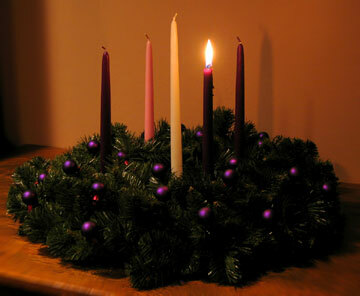 We will be taking our advent wreath up and lighting the first candle tomorrow night. We’ve done Jesse trees, creches and so forth in the past. Wonderful for the kids. The tree we get the week before Christmas. The nativity will go up tomorrow but will be empty except for the animals. Mary and Joseph go in Christmas Eve. Baby Jesus and the shepherds go in before we go to bed. We also do the feast of St. Nicholas where the kids put their shoes out and get a few treats in them. We have also done the Feast of St. Lucia which is a wonderful feast day for the girls in the family. I also try to give up something at Advent although in recent years this has been a hard thing for me, given my circumstances. This year I will be refraining from wine and sweets and focusing on a deeper prayer life. I usually try to do my Christmas shopping in bits and pieces. The emphasis is on less and getting afew items that each person would really like. No one gets big ticket items. We also get a few family items that everyone can enjoy. Neither Regina nor I engage in the shopping, etc. until the 17th. We really preserve Advent as a season of quietude and introspection. We use the Advent wreath, the Advent calendar, etc. But we don’t engage in the endless preparation for Christmas Day. (Of course, we indulge the children’s Santa talk) However, the older I get, the more I feel the need to focus on my shortcomings, my sins, and the reality of eternity which seems to begin looming on the horizon. That’s what the first part of Advent is for. It is the focus on the SECOND Coming of Jesus. Dr. N if I waited until the 17th of Dec to do my shopping I would not get anything for my kids. There simply wouldn’t be the time, 8 days before Christmas especially since I work and don’t get holidays other than the 24th and 25th of December. I also have alternating 6 day work schedules which means I also loose a Saturday in there somewhere! Sometimes, when I’m really organized, I get my shopping mostly done before Advent. For example, yesterday several of my daughters and I went to a art gallery sale of local artisan’s jewelry. I purchased gifts for them at the sale. Another daughter wants replacement sketch pads and markers (she specializes in cartoon figures) so that is an easy trip to an art supply store which will not be busy this time of year. I think the key is not to get caught up in the commercialization. Malls drive me crazy. No parking, rude people and the pressure to buy buy buy. The idea that people spend hundreds of dollars on their kids gifts is mind-boggling. He has a great blog. And he’s the guy who runs the show Currents, where that clip comes from. The first Christmas was probably the quietest Christmas the world has ever known. The noise has gotten gradually louder and louder ever since and the party has moved from the animal shed back to the full rooms of the Inn carrying on with drunkiness and debauchery. The little babe is once again left alone with its parents. The party was for Him, and he was not even invited.